This is an ad I created for my Copywriting I course in Fall '08. I was looking to target the general public, but more specifically those aged 25-45 with good vision because these people haven't experienced what it's like to have blurry vision. 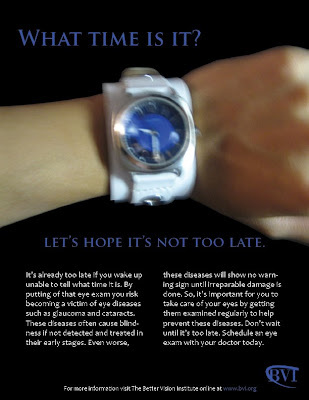 The single message I wanted to convey is that it's not too late to get an eye exam. Scoop DeVille - "It's That Important"